Image caption Who could choose between Sarah Lynn and James White? The latest series of The Apprentice has reached a surprise climax. Lord Sugar has chosen both finalists to be his business partners, for the first time in the BBC show's history. 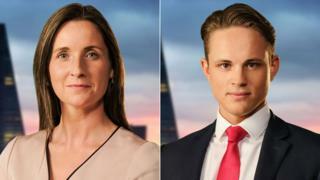 The business mogul said he "genuinely couldn't decide" between sweet firm owner Sarah Lynn, 35, and James White, 26, who runs an IT recruitment company. As a result, both candidates receive a £250,000 business investment and 50/50 partnership with Lord Sugar, who called them "fantastically skilled people". "This particular year, I'm going to double my investment," Lord Sugar told them. "I'm going to start a business with both of you." Usually, Lord Sugar gives £250,000 to just one winner. According to the BBC, this surprise double "hiring" does not constitute a format change. But some fans were unhappy with the conclusion and reacted strongly on Twitter. Another felt the candidates in the final weren't up to scratch. But not everybody minded the twist. And previous Apprentice winner, Dr Leah Totton, agreed. An audience of 6.5 million tuned into the final to see Lynn, from London, go up against White, from Birmingham. Over the course of the 12-week series, the pair had seen off 16 other candidates to compete with each other for the privilege of becoming Lord Sugar's business partner. How long can The Apprentice keep going? The final episode saw Lynn and White pitch their business plans to Lord Sugar and his panel of experts. "It is quite obvious that there are two fantastically skilled people there," said the 70-year-old magnate before reaching his decision. "Deciding on a winner was the most difficult decision I have had to make in all 13 series of The Apprentice to date," said Lord Sugar in a statement. "James and Sarah were extremely impressive and their proposed business plans were very different but equally strong. "I genuinely couldn't decide between them, so after deliberating long and hard, I decided to stump up £500,000 and invest in them both." Lynn said she felt "shocked and amazed" to be declared the joint victor alongside White, who said it was "very, very humbling" to be Lord Sugar's business partner. The investment will allow the pair to build their respective confectionery and recruitment businesses.